INDIANAPOLIS — Lawrence police are asking for help identifying a thief who conned two Lawrence churches into letting him inside. 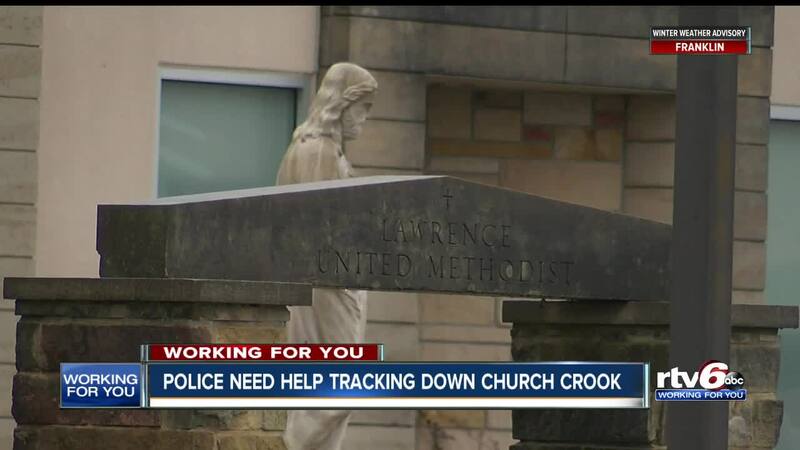 "We were getting our offering from the day before ready to go to the bank," Administrative Director of Lawrence United Methodist Church, Linda Hogue, said. It was a seemingly normal day at Lawrence United Methodist Church, when an unexpected visitor stopped by, earlier this month. "This gentleman came in and said he’d lost his cell phone – maybe – the evening before at a meeting here, and wanted to look," Hogue said. The church hosts AA meetings for people trying to change their lives for the better. Employees walked the man around the church trying to find the lost phone. "He just happened to see the deposit ready to go and just grabbed it and ran," she said. Hogue was in her office. "I heard her screaming so I knew something had happened," Hogue said. The man got away in a dark colored car. This is not the first time a man of the same description driving the same type of car has targeted a church in Lawrence. A man driving a Lincoln sedan entered the Cornerstone Baptist Church in December. Inside, he asked for money. Once he left, church employees realized he stole a purse with valuables inside. Hogue's message to other church's around town is to be a more aware of the surroundings. Since RTV6's report on burglaries at church's around Indianapolis in early January, at least four more church's have reported thefts or burglaries.